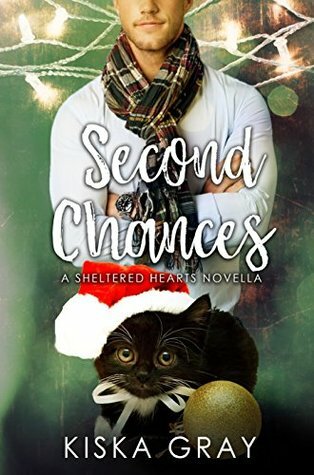 Second Chances Review ~ A perfect holiday story … 9 out of 10! Cover Art: This cover is nice. It has a black kitten wearing a red Santa hat with a bow and an ornament. There is a man with his arms crossed standing behind it in the background. I liked the background color and the lights. The title’s font is rather interesting, and it is easily readable. Main Characters: Nikolas Steele and Ky Kendall were old friends turned lovers who meet again after a six-year absence, at Santa’s grotto, with Nikolas playing Santa and Ky taking his daughter to see him. The men are human beings who have real problems and yet they manage to get a second chance at love. Secondary Characters: The children who visited Santa were cute and their dialogue was realistic. Plot: This plot is straightforward. A reconnection between two men torn apart by family and religious beliefs. Conflict/Climax: Nikolas and Ky have a history that caused them problems in the story. The author handles it rather well. The conflict was realistic. The author gave it emotion and depth. The reader can see the pain it caused them. Flow/Continuity: I liked how this story flowed. The author did a great job of blending the characters’ thoughts about their past history and their passion for each other. The intimate scenes between Nikolas and Ky were electric. Writing Style: I believe that this story was told from Nikolas’ perspective. I think that it was well done. Conclusion: I think that this story was perfect for the holiday season. It is a romance that reconnects two men and gives them a second chance with love. The author produced decent dialogue and characters that are unforgettable. I think that this was a good start to a new series. For all these reasons, I give this story 9 out of 10 stars! Previous Until Proven Review ~ Well-constructed plot … 10 out of 10! Next Rebel Review ~ Beautiful story … 10 out of 10!